As French architectural historian Bruno Bruguier was revisiting Prasat Ta Moan Thom in Oddar Meanchey province earlier this year, he noticed that the road next to the 11th-century Hindu temple had been built on rough terrain in the Dangreb Mountains. He also saw flat land a few kilometers east, seemingly a much easier place to put the road. But King Jayavarman VII, one of the few Buddhist kings of Angkor, purposefully built the thoroughfare on the poorer land closer to Ta Moan Thom, placing a Buddhist traveler’s rest house and chapel nearby the temple. 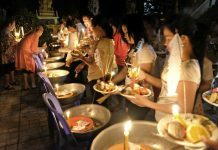 This is a strategy that Jayavarman VII would use repeatedly to spread Buddhism as he strengthened his empire and developed its road network, he said. This field trip was part of Mr. Bruguier’s extensive research process for his third book on the country’s monuments, which will be released on Monday in French. Entitled “Banteay Chhmar et les provinces occidentales” (“Banteay Chhmar and the Western Provinces”), it begins with a discussion of the 11th- and 12th-century monuments near Battambang City, and ends with Prasat Lbeuk Smaoch of Oddar Meanchey province. However, as Mr. Bruguier specializes in the study of networks and road systems, he also addresses in the book how these monuments were linked to each other by roads and navigable rivers, creating a vast communication network across the Khmer empire. In some cases early on, a road may have been built over ancient paths leading to monuments erected in previous centuries, Mr. Bruguier said. Then, in the 12th and 13th centuries, kings and especially Jayavarman VII launched efforts to create a vast road network linking major monuments in the empire. So travelers’ rest houses were built along future roads and stone bridges spanning waterways began to be constructed. Many of these bridges were never finished, particularly those farther from Angkor, Mr. Bruguier said. “We are in the presence of an incomplete infrastructure,” he said. “This project of building the empire collapsed after the reign of Jayavarman VII [in the early 1200s]. There was a tremendous effort made to build [the road network], but it never was in place.” All that is left of some planned bridges are stone pillars beside waterways meant to hold temporary floating bridges. About half the book is dedicated to Banteay Chhmar in Banteay Meanchey province. 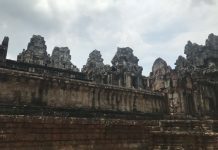 “Banteay Chhmar is one of Cambodia’s most important monuments, whose proportions are nearly unequaled in expanse apart from the Preah Khan of Kompong Svay, and also for its historical importance during the reign of Jayavarman VII,” Mr. Bruguier said. The temple’s walls include detailed and accurate carvings of Jayavarman VII’s armies in land and sea battles, such as a battle against the Cham on Tonle Sap lake. Interestingly, some Cham soldiers, recognizable by their hairstyles and headwear, can also be seen fighting on the Khmer side. “Jayavarman VII spent his youth and a large part of his life in Champa before reconquering his kingdom,” Mr. Bruguier said. The king maintained strong alliances with some sovereigns of Champa, which was a series of small kingdoms. A member of the French research institution Ecole francaise d’Extreme-Orient (EFEO), Mr. Bruguier has been studying monuments in Cambodia since 1995. For several years, he worked with a team from the Ministry of Culture to inventory and create a map of all the monument sites in the country. Compiled with the assistance of researcher Olivier Cunin and painting restoration expert Juliette Lacroix, his new book was written for the general public—people who are looking for more in-depth information than they could get in a tourist guide, but don’t want to wade through a scholarly essay. 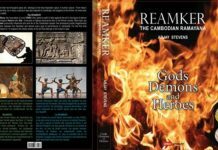 It includes a short glossary of architectural and archaeological terms and Khmer words, and special features such as an illustrated diagram of Cham hairstyles and headwear so that people can identify them on Banteay Chhmar’s wall carvings. This book is the third Mr. Bruguier has published on sites of specific regions of the country. He writes in French, but the EFEO plans to have all three books translated into English soon. Mr. Bruguier will also give a lecture on Tuesday at 2 p.m. at the Royal University of Fine Arts in Phnom Penh on the monuments of western Cambodia.